Munich – FC Bayern Munich may have to wait another week to wrap up a 22nd Bundesliga title, but a 9-2 demolition of Hamburger SV will have gone a long way towards assuaging any disappointment at missing out on becoming the Bundesliga’s first ever March champions. Borussia Dortmund’s win at VfB Stuttgart earlier on Matchday 27 meant that the Reds couldn’t sew up the title this weekend but goals from Xherdan Shaqiri, Bastian Schweinsteiger, Arjen Robben (2) and four-goal hero Claudio Pizarro made it a memorable weekend for the Reds nonetheless. HSV, meanwhile, for whom defenders Jeffrey Bruma and Heiko Westermann managed to get on the scoresheet, were left nursing their heaviest league defeat in 43 years. The home side began the game with the same intensity that had seen them open up a 20-point lead before the weekend’s action, and barely five minutes had been played before the Reds broke the deadlock. Shaqiri, starting in place of the rested Franck Ribery, received a pass from Toni Kroos arrowed a low strike into the corner. It was the price that Hamburg paid for a passive start to the game, but they failed to learn their lesson, and before the first half-hour had was up, the game already looked beyond them as they found themselves 3-0 down. Schweinsteiger ghosted in at the near post to nod in completely unchallenged for his sixth of the season, a personal record for the Germany international, before Pizarro tapped in following Javi Martinez’s flick on. 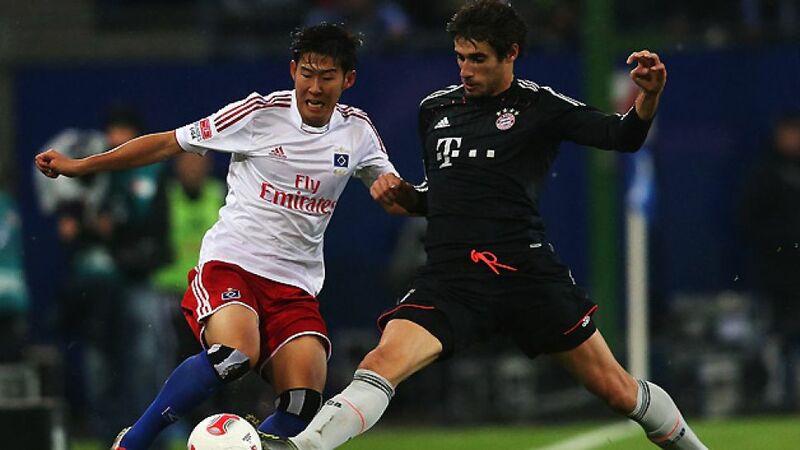 In identical fashion to the last time the two sides met in November, Bayern had raced into a 3-0 lead. This time, however, there was more to come. Robben slotted home a fourth and Pizarro added another after Shaqiri’s shot had hit the post. It was the first time in Hamburg’s Bundesliga history that they had conceded five in the opening half, but the carnage didn’t end there for the beleaguered northerners. Just five minutes after the restart, Pizarro back-heeled in for his treble, taking him to tenth, above club chief executive Karl-Heinz Rummenigge, in the list of all-time Bundesliga scorers, before Robben’s delightful chip after Bruma’s error made it 7-0, still with just 54 minutes played. Bayern head coach Jupp Heynckes then introduced Thomas Müller and Franck Ribery to the action, and the former promptly set about getting involved in the goalscoring party, collecting the Frenchman’s pass and cutting the ball back for Pizarro to add his fourth and his side’s eighth. Jeffrey Bruma headed in from a corner for 9-1 to ruin Manuel Neuer’s clean sheet, but Ribery maintained the eight-goal difference by curling a shot beyond Adler a minute later. The final goal in a sensational game fell to Hamburg’s Westermann, whose header left the final score at 9-2. It was little or no consolation for Thorsten Fink’s men, however, who missed out on the chance of climbing to fifth in the table. For Bayern, their preparation for the visit of Juventus in the UEFA Champions League on Tuesday couldn’t have been better.